The primary step of any successful business is giving people what they need and want. It can be tricky - I hope this checklist makes it easier for you. Want to Get The Most Out of Your Website ? The next step is setting up a website that makes it as easy as possible to run online marketing. It's 2015, so we've been developing websites and marketing for 12 years now ! I've written a 2nd plan that I hope it will make set-ups faster & easier by bypassing some of the learning curve we had to go through. How to increase the earning potential of a website by getting in a marketing 101 basic. How to increase people contacting you from your website by laying it out right. How to get help from outsourcers so you can get it done. Website hosting that can reduce the hassle. How to configure WordPress sites to save you time and effort. SEO ( search engine optimisation ) intro stuff. Reducing the effort required to run offers and create landing pages. How to know what people are doing on the website, so that you can do better ! 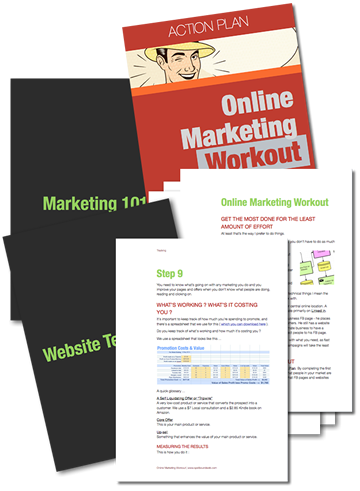 What's a Marketing Workout ? 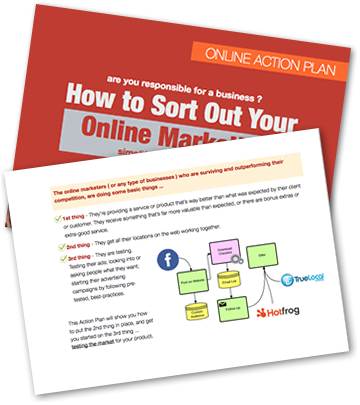 It’s the steps needed to put the physical bits of online marketing in place, with details on how to get each step done. The hardest part of online marketing is getting the first sales funnel working. You don’t know me yet ! So I need to build some confidence in my products. Are you easy to contact ? Yep. Please let me know if the Workout’s any good and ask for more data if I’ve left you at a dead end. I want this to be really useful. No probs if you want a refund later. Just let me know.